Dogs Trust: First dog rehoming through Twitter sees Suzie from Ballymena finding a home! First dog rehoming through Twitter sees Suzie from Ballymena finding a home! It started with a woolly-haired dog picture, and a mild resemblance to Kevin Keegan's hair heyday. I found it cute enough to put on Twitter, and that's where supporter @emmao414 saw it. It turned out that she lives near Dogs Trust Ballymena, and was quite won over by Gia's good looks. Knowing her mum was in the market for a new pal, she swiftly called the centre to make sure Gia was still available, and headed over the same afternoon for a visit, having very sensibly done some research into Irish Water Spaniels. Although Gia turned out to be a bit big and exuberant for her family, Emma and her mum found their heads turned by a gorgeous six-year-old Pomeranian cross called Suzie, who's all set to move into her new home at 2:30pm today! This is the first time we have been able to make a match through one of our social network pages, and we're so pleased that this strategy is beginning to work for supporters and dogs alike. To our knowledge, it's the first time any animal charity has used Twitter in this way, and we plan to work hard to make this the first of many. 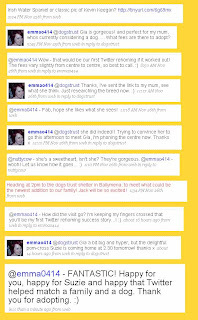 You can click to enlarge the picture above to see the actual online exhange that took place, but all that really remains is to fervently thank Emma and her family for choosing to adopt a rescue dog. We hope Suzie settles in quickly and has a wonderful life with you! By the way, Gia is still seeking a home, so if you're interested in the curly haired beauty, please do give Ballymena a call on 028 2565 2977! Dogs have a special place in my heart. I'm hoping to get started on my charity to help rescue dogs a place to call home.